CompTIA Certified Technical Trainer (CTT+) certification is a cross-industry credential that provides recognition that an instructor has attained a standard of excellence in the training field. Institute of Information Technology CompTIA CTT+ course is the only 5-day class that prepares you for all three CompTIA CTT+ exams. The course not only focuses on traditional classroom style instruction, but also on delivering training virtually. IIT has packaged this unique and comprehensive program while considering the co-existence of both classroom and virtual training styles, and the growing adoption/popularity of virtual training. Institute of Information Technology's CompTIA CTT+ is a highly interactive and participant-driven course designed to cultivate the technical training and concept delivery skills in trainers, technicians, subject matter experts, presenters, sales and support staff in any organization. The participants will connect abilities, theories and situations to create their most effective instructional styles. This course is accepted by Microsoft and ProSoft towards their MCT. In this course, each student will be required to prepare training materials and to serve as the class instructor for a minimum of 5 hours. Earning the CTT+ certification designates you as a recognized trainer in your field. As an instructor, you not only have to plan engaging classroom lectures, practice tasks and exams, but you must also be a knowledgeable and effective communicator. CTT+ certification provides comprehensive training standards to validate your skills in a traditional or virtual classroom environment, and ensures that you can teach effectively and step up to the front of the class with confidence. This certification is targeted towards all training professionals and can be applied to all industries that provide technical and non-technical training and education. CompTIA CTT+ validates that you have the necessary skills and knowledge to prepare, present, facilitate and evaluate a training session. By requiring a video submission of the training session instruction as part of the certification, CTT+ ensures that candidates have effective teaching skills. In a survey conducted by the Training Associates, 87% of respondents use instructor-led training (ILT) as a primary learning modality. Moreover, 74% of organizations take a blended approach to learning, augmenting ILT delivery with either a mobile, video, or social component. Earning a CTT+ certification can validate your skills as a recognized trainer in either a virtual or physical classroom. 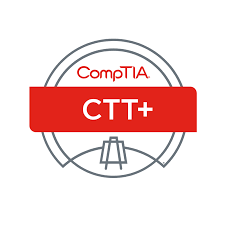 CompTIA CTT+ is a qualifying certification towards your MCT status validating your instructional skills. Please note that simply taking the CTT+ course or passing the exams won't grant you a MCT status. You will need to meet other Microsoft requirements in addition to achieving your CTT+ certification. 3. We not only record your videos, but also review your video files prior to submission, and convert the files for you based on CompTIA accepted formats. 4. We strongly recommend preparing for all 3 exams even though only 2 exams are required for a CompTIA CTT+ certification designation. Both Classroom and Virtual based are equally important given the industry trends. Measure the core knowledge and skills that competent instructors must successfully demonstrate to complete an instructional assignment successfully both in a classroom and a virtual classroom environment.